Step to Life: It's Fer-de-Lance season, Watch Out! It's Fer-de-Lance season, Watch Out! 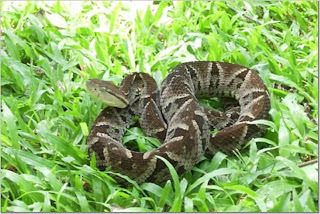 Fer-de-lance snake in the grass. The fer-de-lance is a venomous species of pit viper. Notice the characteristic diagonal stripes and diamond pattern. Bites MUST be treated with anti-venom, not merely antibiotics. "Be very careful walking your dog. The heavy rains are bringing out the snakes, and it is the breeding season for snakes as well. This past week I know of one Cuidador (gardener) that got bitten by a Fer-de-lance, and several dogs that got bitten. If anyone gets bitten by a Fer-de-Lance you need to get the anti-venon ASAP. Dr. Greco has some with him most of the time. In the past month I have seen several large snakes crossing the street near Greco's home and on the road near our homes, and they are referred to as X's. Be careful." The fer-de-lance is a highly venomous species of pit viper, and bites must be treated with anti-venom. Antibiotics are not sufficient or proper treatment. This snake is also sometimes known as terciopelo (velvet), or in Guatemala as barba amarilla (yellow beard). Adults generally have a length between 1.2 meters and 1.8 meters. The color pattern consists of diagonal stripes and diamonds in various shades of brown, with pale yellow underneath the head. The fer-de-lance is mostly a nocturnal species. During the day it hides among tree roots or leaf litter. But the snake may seek refuge in the shade of a home; many bites occur indoors as well. They can be very excitable and unpredictable when disturbed. They may choose to flee, but may turn suddenly and attack. The fer-de-lance is the most dangerous snake in Central America, responsible for half or more of all snake bites, with a fatality rate of about 5%. So be careful! Don't walk in tall grass unless you're wearing long pants and boots; and steer clear of anything that looks like a large stick. If you see a fer-de-lance don't try to handle it yourself. Stay away and call the local authorities.